Mayor of Minneapolis, Vice President, and U.S. 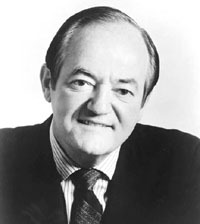 Senator (and Democratic Whip 1961-4). Ran for President in 1968 but lost to Richard M. Nixon. Bladder cancer, which had spread to his lymph nodes.